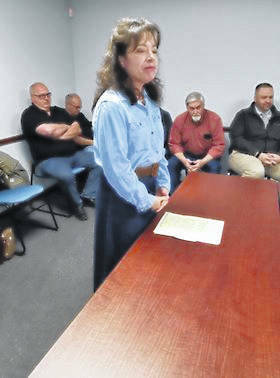 BELLVILLE – Deborah Dickson was named the new member of the Bellville village council last week. Dickson appeared before council last Tuesday with three other interested persons. Council went into executive session to fill the post created when council member Jason Potes resigned several weeks ago. She was sworn in Thursday. Dickson told council she has been in Bellville two years. She said her husband is from the area and she wanted him to have a chance to retire in the valley. Because she is an “outsider,” Dickson said, she is probably not familiar with “little nuances” or the political history of Bellville. She said she has participated on the committee working with Bellville beautification efforts. Dickson appeared with Rich Osborn, a former council member, and Robert Evans, who had visited a recent council meeting. Marleena Skeens visited council to report a concern about a neighbor who is keeping bees. After her report, she said she would also be willing to be considered for council. All were asked about their visions for the village, and if they would be willing to put their names on the ballot when there is an upcoming election. All three said they would. Osborn said he has been a person who “stood with residents” of the village. He said the majority of those resident still want their quiet life. He said he thinks people sometimes forget about the “home town feeling” one gets in Bellville. Council member Josh Epperson said perhaps “something got pushed through” in the past and that could have concerned people. Evans referred to his experience with people in his job at a hospital in Columbus. Skeens said she is a person who is concerned about preserving green space. She said bee hive activity has continued next to her home. Her husband is violently allergic to bee stings, so she feels she has to monitor activities closely. Village administrator Larry Weirick said he would talk to Police Chief Ron Willey about the potential violation of regulations on bee keeping.